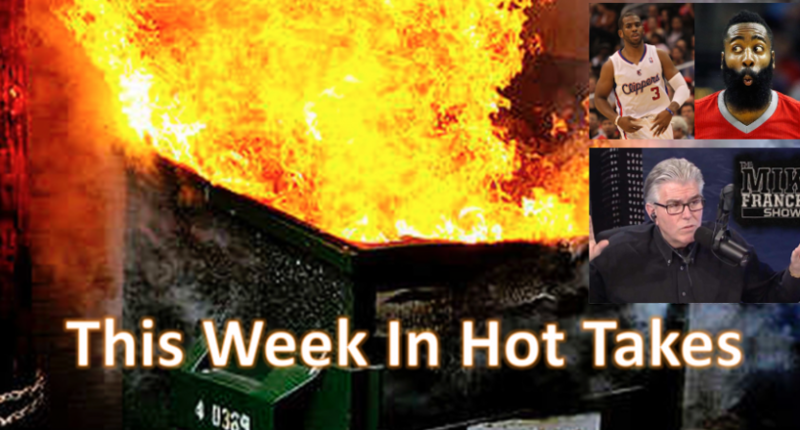 This Week In Hot Takes: Phil Mushnick on Mike Francesa's "daily disregard for the truth"
Mushnick's long feud with Francesa boiled over this week, giving him top spot in our hot take roundup. Welcome to another edition of This Week In Hot Takes. This time around, we’re looking at the hottest takes from sports media members from June 23-29. Let’s get to it! Wright responds “Of course it’s possible! But isn’t it also possible that Danny Ainge is paralyzed by fear? Isn’t it also possible that Danny Ainge doesn’t really know what he’s doing?” Pretty hot take there about a general manager who’s won a title and had a team that just finished with the top regular-season record in their conference. James Harden will soon become the NBA's most frustrated player and ultimately turn into the league's unhappiest. No longer his team. So, Paul is simultaneously both good enough to make it “his team” over the MVP runner-up and bad enough to be “not a big difference-maker”? Huh. This starts with Russillo playing Dakich’s comments from Saturday, “To me, Chris Paul’s the guy, we call it in coaching ‘good enough to get you beat, good enough to get you fired. …Why don’t Chris Paul’s teams overachieve? They never do. They generally underachieve, and I point at him as being a fraud.” Dakich then defended the take further saying “I think he is…Chris Paul is the guy that looks like the leader, but nobody follows because they know he’s full of crap. He looks like the guy management and coaches can trust, but there’s no way in heck they can trust him once they get to know him for 10 minutes. …His teams never do well! There’s always bickering, there’s always complaining, there’s always whining, and he’s the leader!” This take’s pretty stupid, considering that many of Paul’s teams have done pretty well (just not as well as their opponents with better overall rosters), and that judging players by team success is incredibly flawed. Both Plaschke and Dakich dialed up the heat here, so both get this rating. I’ve been in digital media for 12 years. One thing I’ve learned is that nobody wants to read anything over 1,000 words. MTV is more proof. Gray was promptly and deservedly roasted by colleagues and other media members. There’s maybe a debate to be had about what makes good longform, and if there are too many longform pieces that shouldn’t be long, but the stats posted in reply to Gray demonstrate plenty of people are willing to read long pieces (many of the most-trafficked pieces on the web are long) if they’re on an interesting subject, well-constructed and deserving of the length. Gray (who’s mostly known for running SI’s Hot Clicks and Swim Daily, so photos of scantily-clad women with or without accompanying sports links) could have said something less provocative about “short content works well on the web” or “not everything needs to be long,” and maybe started a more interesting conversation, but instead, he fired up the take-o-meter and offered a blanket “nobody” that isn’t true. And he also chose a pretty insensitive time to make that argument. One therefore wonders why Chernoff, the boss, didn’t issue a denial. Or could it be that he knows WFAN staffers heard the expletives-filled scream-out which two claimed was impossible not to hear? And it was specifically about ratings, Chernoff telling him the fall-off likely resulted from Francesa spending too much airtime discussing horse racing prior to Triple Crown races. Besides, Francesa’s self-serving career-long, daily disregard for the truth is such that one needn’t waste time and imagination with fabrications. And despite that call Francesa took from the Pentagon seeking his advice, and despite his sources in New Jersey law enforcement he claimed were assigned to investigate Lawrence Taylor’s arrest (Francesa thought Taylor had been busted in Jersey when it was New York) — just two of my favorite Francesa lies — I’ll risk the consequences of his powerful position and friends. Mushnick and Francesa have been feuding for over a decade, but this latest back-and-forth is certainly bringing the heat, and the humor. Honorable mentions: Stephen A. Smith for this gleeful rant about Phil Jackson’s departure, Pierre McGuire for saying “Analytics stink” because they wouldn’t have predicted that short and slow Mark Recchi would have done well in the NHL (uh, NHL analytics aren’t usually just about height or speed, Pierre, and many advanced stats probably would have projected Recchi better than those metrics). Notable absences: Smith, Colin Cowherd, Shannon Sharpe.